In this week’s e-learning challenge, David Anderson asked us to create something based on the “two truths and a lie” game. 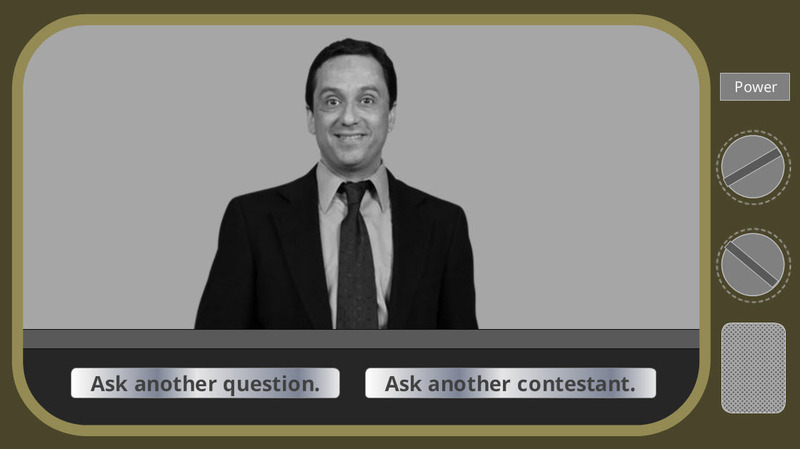 He gave us some flexibility in what we could create and so I decided to create a gaming experience using Storyline 2 based on the classic “To Tell the Truth” game show. Rather than talk about myself this time, I thought it would work better to have three people pretending to be an e-learning expert. That way players (who are usually other e-learning designers) would be able to test their professional knowledge. The way the original game works, two people are pretending to be someone they’re not, and a third person is the “real thing” – in the case of my game, you have to guess who is the real e-learning expert. You get to ask each person up to three questions, and then based on their answers, you pick the most likely candidate. I created a simple TV set out of shapes in Storyline, and just had a very basic set design which the contestants stood behind. I was particularly proud of the credit roll I created at the end of the game which also gave me the opportunity to tell people how much of the experience I created from scratch. I have to mention that I created all the music and voices for this game. I originally recorded just me mouthing the theme music which I later recorded using “real instruments” such as a trombone sample, upright bass sample, and a drum machine beat that I tapped out by hand using a metronome. 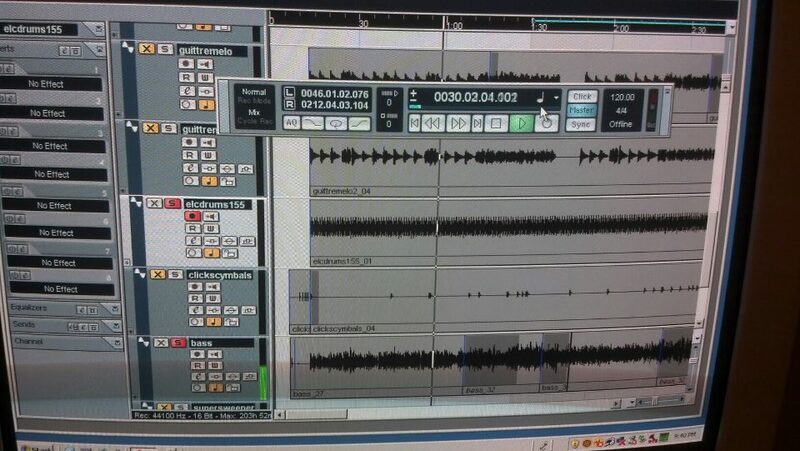 I used Cubase software to record the music. I recorded all the voices right into the condenser mic on my laptop. Normally, I’d use my very nice Audio Technica microphone and record all the voices in Cubase to avoid distortion and get a very clean, crisp sound. But since this was all theoretically coming out of a little TV set speaker, I decided to just stick with the recordings I originally made directly into Storyline. I also had captured the moods and humor of the various characters well enough, that I didn’t want to lose their original tone. So, check it out below and let me know what you think! This week I used Articulate’s Storyline 2 e-learning software to create an interaction demonstrating the sounds and features of a guitar effects pedal-board. 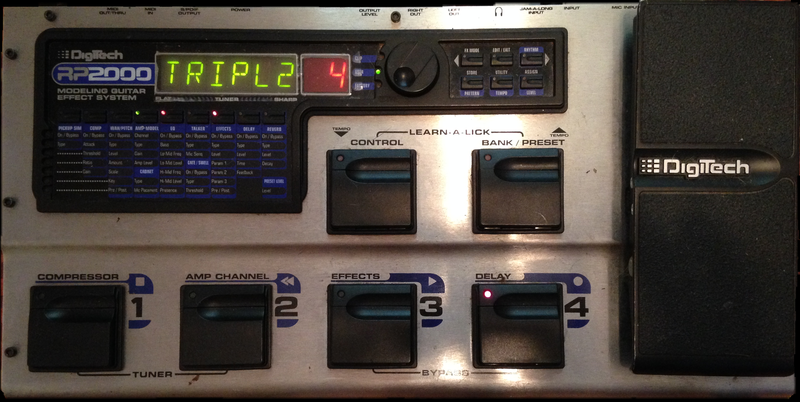 As a guitarist, I use a small number of effects: my Ampeg amplifier’s built-in distortion, a combination pitch-shift/delay pedal and DigiTech‘s RP2000 pedal-board. This unit has 64 preset sounds and 64 sounds you can modify. There are all sorts of features and effects this pedal-board offers, but since I’m only doing this as an example of what you can do in Storyline 2, I chose to only explore four distinctive sounds and to demonstrate how the large pedal on the right affects just one of those sounds. First I needed to take a number of pictures of the unit with the different effects selected. I used a tripod to steady my iPhone so that each picture would be in the same exact position. Despite this, I discovered that the four pictures were all slightly skewed to the left, so I used Macromedia Fireworks to fix this using its “Free Transform” tool. Most people use sliders as an alternative to the old “click and reveal” interaction. In “click and reveal” users click an object and either another slide or layer is revealed. So with sliders, rather than users clicking to reveal or activate something, they slide to it. In this interaction, I wanted users to be able to slide to each effect button and then hear what it sounds like. Since Storyline 2 allows you to have sounds and not just images on its layers, I was able to use layers to accomplish this. I created layers for each sound and popped the pictures into each layer. My slider had four positions, one for each layer, and I created triggers to reveal each layer as users slid over each of the effect buttons in the picture. The problem was I couldn’t get the spacing of the different slider positions to match the positions of the pedals as they were not evenly distributed! E-learning designer Jackie Van Nice told me that she saw an interaction created by another designer Nancy Woinoski where she used over 100 slider positions to get the spacing just right on one of her creations. Following her lead, I ended up with 20 positions. I set each sound’s trigger to be greater than/lesser than a range of positions where the foot appeared to be on top of each individual effect pedal. When you use layers, any image you put on a layer will cover up what’s on the base layer. Because I needed the image of the foot to appear to be sliding over each pedal and not disappearing under it, I need to get creative to make it look right. So, I cropped out bits of the different images of the pedal-board on each layer so the foot would never be covered up, but you’d still see the current sound’s name on the LED and all the correct lights would be lit up. Another obstacle I ran into was that when the foot would slide over each pedal, sometimes my little cropped images of the lights would appear on top of the foot. To remedy this, I set triggers to change the states of those cropped images from “normal” to “hidden” and back according to the position of the foot on the slider. As much as I like to anticipate and avoid potential problems in creating e-learning interactions, I’ve found that you have to be patient, creative, and flexible in the process. There’s no way I can cover in a blog post in complete detail everything I did to create an interaction. But hopefully, this blog has helped you find ways around obstacles you might encounter in the creation process. So, are you ready to jam? Click the picture below to start my little guitar effect pedal interaction! Every week David Anderson from Articulate offers e-learning challenges for designers and developers to hone and demonstrate their skills, and to learn and get inspired by their peer’s creations. My guitar effect pedal interaction was in response to his 88th weekly challenge. If you want to get inspired, show off your skills, and grow as an e-learning developer/designer, I highly recommend you check out the Articulate community.